In addition to cameras, Francisco Aguilar’s firm, Bounce Imaging, will provide room for other sensors in its ball-shaped surveillance devices. In last summer’s popular movie “Prometheus,” astronauts explored a huge derelict spaceship by flinging baseball-size sensors that took digital images of the vessel as they flew along. Francisco Aguilar is hard at work on the same idea. 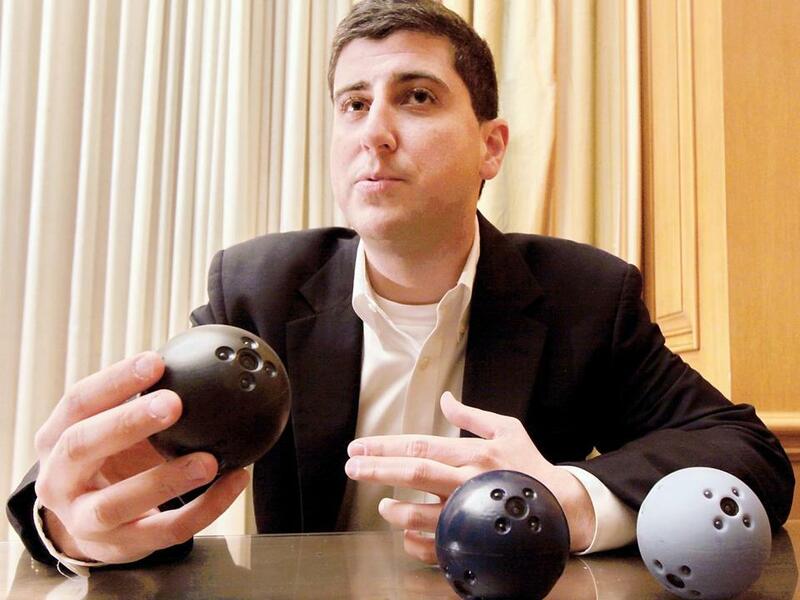 Aguilar’s Boston company, Bounce Imaging, is developing a ball with six cameras inside for 360-degree viewing that can be used as a ­surveillance device by police and firefighters in hazardous situations, such as a hostage taking or a chemical leak. “It’s just basically a way to get rid of the dark, scary spaces of the world,” Aguilar said. Bounce Imaging showed off nonworking prototypes of the ­device, called the Explorer, at the recent Consumer Electronics Show in Las Vegas. The Explorer will also have room for sensors, perhaps a microphone for listening to hostage-takers or a detector to warn firefighters of deadly cyanide gas. One of the keys to Bounce Imaging’s plan is to make Explorer inexpensive enough to be widely deployed by municipal public safety agencies. Similar surveillance devices on the market are still too expensive for most local police and fire departments. For example, iRobot Corp. makes surveillance robots that roll through buildings on caterpillar treads, but those cost thousands of dollars. The Explorer could sell for as little as $700 and could be controlled through a smartphone. This could make the system cheap enough to issue to all emergency workers. “By having a good enough quick solution, you can get it to the people who need it,” ­Aguilar said. A first responder would simply toss the Explorer into a hazardous area. The device would use a radio to transmit pictures and sensor readings to a smartphone. An app would collects the photos and knit them into a 360-degree panoramic image, allowing users to see exactly what lies ahead. Bounce Imaging is working with phones that run Google Inc.’s Android operating ­system. “We’re starting with that because it’s the cheapest thing that police can buy,” Aguilar said. But he also plans to offer a version compatible with ­Apple Inc.’s iPhone. Aguilar, a native of Costa Rica­ who came to the United States at age 10, studied organizational strategy at Harvard University’s Kennedy School of Government and the MIT Sloan School of Management . He has worked at Chinese electronics companies and at a mobile phone carrier in ­Afghanistan. When he came up with the idea for the Explorer, Aguilar recruited engineers from Costa Rica, Russia, and Poland to create the complex software to make it work. He also approached Mass­Challenge, a nonprofit organization that hosts competitions to select highly innovative business ideas. In October, the company’s Explorer concept won a $50,000 MassChallenge prize, money to help turn the idea into­ a salable product. Bounce Imaging has not built a working model of the Explorer yet, but similar devices have come to market. The Boston Police Department’s SWAT team uses the Eye Ball R1, from ODF Optronics Ltd., of Israel. It is an $1,800 camera-equipped sphere that can be rolled into hazardous areas or extended at the end of a pole. A Minnesota firm called ReconRobotics markets a lightweight, barbell-shaped ­surveillance device called the Throwbot. The concept has also ­attracted independent inventors. In 2011, a German inventor, Jonas Pfeil, demonstrated a soccer ball-size device that automatically shot panoramic photos when tossed in the air. Closer to home, Boston artist and inventor Steve Hollinger earned a patent last year for his own throwable camera-ball, which differs from the ­Explorer. Hollinger has ­designed the device to focus on a particular object and keep taking pictures of it as the camera-bot is thrown through the air. The Explorer lacks this feature. But like Aguilar, Hollinger has not built a working version of his invention. He said he has reached out to Bounce Imaging but received no reply. Aguilar said his attorneys have studied Hollinger’s patent and decided the two devices are different enough that there is no patent infringement. When the Explorer enters field trials this spring, local first responders are eager to give it a try. Bernard Hicks, a member of the Boston Police Department’s SWAT team, said a ­simple, cheap device issued to all police could result in ­quicker responses to mass shootings. The Explorer could also help firefighters searching for people in burning ­buildings, he added. “It’s something I think everybody should have: fire department, EMS, SWAT, military,” Hicks said. If the Explorer proves itself during tests, Aguilar said, full-scale production could begin this summer.